You know you’re in the hands of a natural born filmmaker when you can feel yourself being tugged, as if by invisible forces, from one shot to the next, into a movie’s diabolical design. 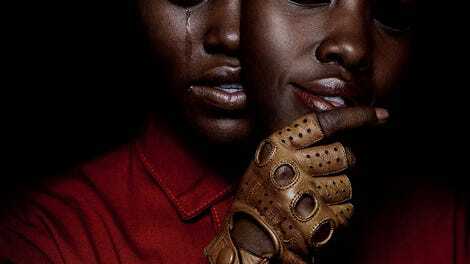 That’s the sensation provoked by Jordan Peele’s Us, which begins with a sequence so expertly shot, cut, and orchestrated that you can only submit to the internal, infernal logic of its construction. On the boardwalk of Santa Cruz circa 1986, illuminated by a carnival glow, a small girl (Madison Curry) strays from her parents’ side. She’s drawn, by signs and coincidence, to that enduring symbol of fractured identity, the hall of mirrors. What she finds inside is a different kind of movie monster: a reflection made flesh, a phantom spitting image of self. It’s the audience, though, that’s really being ushered into the funhouse. And by the end of this ominously enthralling prologue, bracketed on one side by a rabbit-ear TV and the other by actual rabbit ears, you’re ready to go wherever the movie plans to take you. Us, as it turns out, doesn’t go anywhere quite as clever or daring as Peele’s last film, his Oscar-winning transition out of sketch comedy and into the upper echelons of Hollywood. Get Out, remember, grabbed its audience right from the start, too. It was, as they say, a hard act to follow: a slow-burn supernatural thriller that was really a damning satire about the way racism survives and thrives, even in the coziest of liberal enclaves. While hardly devoid of ideas (whether telling jokes or staging scares, Peele remains an incisive social critic), Us operates in a less directly subversive mode. And yet if Peele is taking his victory lap in the genre sandbox—having a grand time, not making a grand statement—it’s with enough panache to continue outpacing the competition. He’s made a primo popcorn slasher: fun, funny, elegant even when aiming for the jump-scare reflexes of the same multiplex crowd that gobbled up Get Out. The little girl in the opening scene grows up to be Adelaide Wilson (Lupita Nyong’o), successful in her professional life and content in her personal one, but still haunted, if only distantly, by memories of that face-to-identical-face encounter at the fair. Leaping ahead to the present day, the film picks up with her on a summer getaway, traveling with her burly goofball husband, Gabe (Nyong’o’s Black Panther costar Winston Duke, hilariously nailing the dad-joke energy), and their two children, teenage daughter Zora (Shahadi Wright Joseph) and preteen son Jason (Evan Alex), to a cabin on the California coast. The weather is lovely, but Adelaide can’t shake a bad feeling provoked by some odd omens. And in much faster fashion than Get Out, Peele confirms his heroine’s worst fears with the sudden arrival of the bizarro Wilsons: hostile doppelgängers of each family member, dressed in blood-red and brandishing gold scissors. These clone intruders, played by the same actors as their counterparts, are nonverbal, with the exception of Adelaide’s childhood double, all grown-up too and speaking in a ghostly rasp. “We’re Americans,” she hisses when her terrified other self asks who or what they are. Couple that line with an alternative reading of the title in all-caps, and it becomes clear that Peele is reaching for some point about the national character—the ugly truth about who we are as a country, buried deep below like the squirming insects at the beginning of David Lynch’s Blue Velvet. It’s a good time for a little collective, cultural self-reflection. But the metaphor doesn’t entirely track. Do these evil twins represent our darkest impulses, our forgotten past selves, or some vague combination of the two? Such scrutiny does Us few favors. It’s better appreciated on a visceral level, as an inventive, often virtuosic spin on home-invasion horror. Working with cinematographer Mike Gioulakis, who made the frame itself a source of terror in the brilliant It Follows, Peele offers up one effective suspense set piece after another—exploiting foreground and background space, locking us into the tunnel vision of the characters, tracking enemy movements around the perimeter of the house in gliding long takes. He even makes the hoarier horror tricks sing anew: By the time a massacre occurs to the timeless strains of “Good Vibrations,” you’ll wonder if he’s auditioning to direct the next Strangers sequel. Though maybe Scream is the better point of comparison: The balance of tones, the teetering between laughs and scares, would make Wes Craven proud. Peele, though, conducts the mayhem to his own malevolent orchestra, even if Us—like Get Out before it—is more giddily entertaining than it ever is scary. This is a director’s and an actor’s film, ultimately—it gets expressive work out of its entire cast, most doing literal double duty. (Outside the nuclear unit at center, Elisabeth Moss and Tim Heidecker, as another couple in the area, make a volatile impression, too.) But Peele counts most on Nyong’o, on her tour de force yin-yang routine, to sell the half-digested themes of dueling dualities. The film eventually gets around to taking its nightmare premise from the irrational to the concrete, providing an explanation that seems less than necessary, on top of not making a whole lot of sense. But there’s an emotional logic, at least, to its climactic shadowboxing—one provided by both Nyong’o and the director spectacularly orchestrating her dance of diametric opposition. Us proves, if nothing else, that Peele has become a blockbuster visionary, fully in control of his craft. It’s a privilege to step back into the funhouse of his imagination.